Cyclospora cayetanensis is a single-celled parasite, too small to be seen without a microscope. It causes an intestinal infection called cyclosporiasis. People can become infected with Cyclospora by consuming food or water contaminated with the parasite. People living or traveling in countries where cyclosporiasis is endemic may be at increased risk for infection. But foodborne outbreaks of cyclosporiasis have been reported in the United States since the mid-1990s and have been linked to various types of imported fresh produce, including raspberries, basil, snow peas, mesclun lettuce, and cilantro. U.S. foodborne outbreaks of cyclosporiasis that occurred before 2000 have been summarized, as were major documented outbreaks in 2013 and 2014. Foodborne outbreaks during the 15-year period of 2000–2014 are summarized here. World Malaria Day 2016: "End Malaria for Good"
On April 25 partners around the globe will join forces to bring attention to ending the threat of malaria. To commemorate the day, DPDM prepared a host of activities, including a web feature, social media posts on Facebook and Twitter, and notices in Emerging Infectious Diseases and the Morbidity and Mortality Weekly Report. PMI is releasing its Tenth Annual Report to Congress, which describes the U.S. Government’s contributions to the global fight against malaria. PMI will also host a World Malaria Day #MalariaChat Twitter roundtable on April 25, 2016 at 9:00 am EDT. Dr. Julie Gutman of DPDM will serve as the malaria in pregnancy expert, and will be live tweeting from 9:30 – 10:00 am ET. Follow @PMIgov and @USAID and #EndMalaria and join the conversation! Have a comment you'd like to share? Send an email to DPDM. A quarterly e-update designed to inform you about CDC's efforts to protect the public from parasitic diseases. Interested in a program update? Use the links to the left under 'What's Inside' to navigate to the full story or scroll below. This NewsBites issue marks my last as Director of CDC’s Division of Parasitic Diseases and Malaria, as beginning in May I transition to PATH to serve as the new director of their malaria and neglected tropical diseases (NTDs) programs. It’s not possible to summarize the feelings and experiences accrued over 29 years at CDC (more than 20 in DPDM) in a few words – and the editors advised me to keep it brief! Suffice it to say that it has been an incredible life-changing journey. I’ve been lucky to have worked with and learned so much from so many of you. Together I think we have made and continue to make a difference in preventing, controlling and eliminating parasitic diseases. Thanks to all for your work, dedication and collegiality. I look forward to continuing these cherished relationships in my new role. Malaria Zero was recently launched as a collective effort to eliminate malaria on the island of Hispaniola (which includes Haiti and the Dominican Republic) by 2020. CDC (represented by DPDM) is leading the consortium of partners, working in collaboration with the Haiti National Malaria Control Program and supported by funding from the Bill and Melinda Gates Foundation to the CDC Foundation. Malaria Zero will implement an evidence-based plan for elimination in the region that will also generate knowledge to support global malaria eradication. In support of Haiti’s new National Strategic Plan, Malaria Zero efforts will focus on research to establish the evidence base for effective approaches and strengthening surveillance and laboratory capacity. In September, partners will launch a household survey and operational research to identify initial geographic areas with high malaria transmission for the first phase of delivering focal mass drug administration. DPDM staff provided remote training on basic entomology to Peace Corps Volunteers in Senegal, as part of Peace Corps’ Stomp Out Malaria Programs, continuing the strong existing interagency collaborations around malaria. The Stomp Out Malaria program mobilizes more than 3,000 Peace Corps Volunteers across Africa to teach families about the importance of sleeping under insecticide-treated bed nets, educate expectant mothers about preventative treatments for healthy birth, and reinforce other malaria prevention efforts. DPDM staff working on malaria and lymphatic filariasis (LF) elimination activities in Haiti are working together on assessment activities using a multiplex bead assay (MBA). The MBA provides a robust approach to the simultaneous analysis of antibody responses to multiple antigens. In the public health context, this assay platform has the potential to generate an epidemiologic snapshot of community exposures to various infections of interest. Approximately 16,000 filter paper bloodspots were collected as part of LF transmission assessment surveys in 2015 and are being analyzed for responses to LF, malaria, trachoma and yaws. Results from the MBA will provide critical information to guide the malaria and LF programs in Haiti. The President’s Malaria Initiative (PMI) Ethiopia team participated in the 7th Ethiopian Malaria Research Network’s Symposium in Jimma, Ethiopia, together with other PMI partners and malaria researchers from the major Ethiopian universities to discuss emerging malaria issues. The team also partnered with the CDC Ethiopia Field Epidemiology Training Program (EFETP) and the Ministry of Health’s EFETP on a malaria and mentorship training program. The training was conducted in Bishoftu, Ethiopia in March with 130 participants including EFETP residents, EFETP academic advisors, selected malaria focal EFETP residents, and WHO field staff. The training will help strengthen Ethiopia’s capacity to address malaria and other public health threats. Two birds with one stone? DPDM staff collaborated with the World Health Organization (WHO) to draft guidance for integrated monitoring and evaluation for LF and onchocerciasis, and identify key research gaps that need to be addressed in order to fully integrate the activities for the two diseases. Research gaps include the serologic threshold for transmission of onchocerciasis, whether LF-onchocerciasis evaluation should be a community-based survey or a school-based one, and what age group of children should be used for assessments for both diseases. DPDM, as part of a WHO Working Group on Capacity Strengthening (WGCS) of the Strategic Technical Advisory Group for Neglected Tropical Diseases, reviewed capacity-strengthening activities in each WHO geographic region. The WGCS was established in 2012 to: i) identify existing capacity-strengthening efforts for Neglected Tropical Disease (NTD) programs; ii) recognize gaps in capacity-strengthening efforts; iii) advise, standardize, and support the implementation of training curricula; and iv) harmonize efforts to increase contributions to fill identifiable gaps and needs. Initial efforts have focused on the development of region-specific training materials. Strategic approaches to disseminate materials and to integrate NTD capacity-strengthening activities more fully into national health plans are still needed. Recent studies in Papua New Guinea and Ivory Coast have shown that the combined administration of albendazole, diethylcarbamazine (DEC), and ivermectin for the treatment of LF was safe and more effective than the standard combination of DEC and albendazole or DEC and ivermectin to rapidly eliminate early stage parasites from a person’s blood for up to two years following treatment. This new regimen could have a transformative impact on the global program to eliminate LF by reducing the number of rounds of mass drug administration (MDA) required to reach elimination targets. Further studies, called cohort event monitoring, are needed to establish the safety of this new regimen. The objective of these studies is to evaluate serious adverse events in 10,000 people exposed to the new regimen. DPDM is providing technical assistance to the Ministry of Public Health and Population (MSPP) in Haiti to implement this study in the commune of Quartier Morin in the Northern Region of Haiti. DPDM staff presented results of the five-year Schistosomiasis Consortium for Operational Research and Evaluation (SCORE) study to Kenyan public health officials. The study demonstrated that school-based MDA has an impact similar to community-wide MDA on schistosomiasis rates and intensity, including evidence that both MDA approaches are effective in reducing transmission. However, MDA had less impact in some geographically related villages using either strategy. Additional studies are being designed to clarify why this is true. As temperatures rise, so do U.S. cases of cyclosporiasis, an intestinal illness caused by a microscopic parasite, and babesiosis, a parasitic infection spread by ticks. Individuals spending time outside in the New England states or the upper Midwest may be at increased risk this time of year. In recent years, the number of states reporting cases of babesiosis has increased, and more states and individuals are taking proactive steps to prevent this infection. DPDM scientists are currently helping investigate a case of babesiosis in a Northeastern state, acquired by an individual who is transfusion-dependent. The patient lived in an urban area and did not report taking part in outdoor activities or having known tick exposures. In March the patient was hospitalized after a two-week history of fever. DPDM confirmed the infection with Babesia parasites. The blood collection agency is following up with donors who provided blood for the patient’s transfusions in January and February. DPDM will test these donors to help identify the source of the infection. Visit your doctor 4-6 weeks before traveling. Prevent mosquito bites, especially at night. If you get sick during or after your travel, it could be malaria: see a doctor immediately. Experiences of a Community-Based Lymphedema Management Program for Lymphatic Filariasis in Odisha State, India: An Analysis of Focus Group Discussions with Patients, Families, Community Members and Program Volunteers. 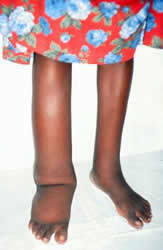 Globally 68 million people are infected with the NTD known as LF, 17 million of whom have lymphedema (swelling of limbs). This study documented significant social, physical and economic difficulties experienced by individuals with lymphedema and their families, including marriage-related issues, social stigma, and lost workdays. The rapid emergence of drug resistant malaria parasites during the course of an infection remains a major challenge for providing accurate treatment guidelines. This is particularly important in cases where malaria treatment fails. Authors show the utility of using next generation sequencing techniques for the early detection of a previously reported atovaquone proguanil (Malarone) drug resistance associated mutation. Detection of Onchocerca volvulus in skin snips by microscopy and real-time polymerase chain reaction: implications for monitoring and evaluation activities. Onchocerciasis, or river blindness, is an NTD caused by the parasitic worm Onchocerca volvulus. Second only to trachoma as an infectious cause of blindness worldwide, onchocerciasis has been targeted for elimination in several African countries by 2025. Effective diagnostic tools is are neededfor monitoring the progress and impact of elimination programs. Authors show that PCR with melt curve analysis can improve the sensitivity of skin biopsies for diagnosing onchocerciasis and is an improved confirmatory assay for monitoring programs that have begun to move toward elimination. Monica Parise, MD will serve as the Acting Director for the Division of Parasitic Diseases and Malaria until a permanent director is named. She is currently DPDM’s Deputy Director for Science and Program.